And this refrain is not new or unique to West Virginia. The ink had barely dried in West Virginia before teachers in Oklahoma made it clear they too could walk out if lawmakers don't find a way to raise their pay and school spending. In recent years, thousands of public school teachers in Oklahoma have crossed state lines for better pay. "It's gotten so bad that the state Department of Education has had to issue emergency teacher certifications to replace teachers as quickly as possible," reported Emily Wendler of member station KOSU in July. "Across the state, textbooks are out-of-date, electives have been eliminated and support positions are being terminated left and right." Even Shawn Sheehan, a math teacher in Norman, Okla., and the state's 2016 teacher of the year, decided he simply couldn't afford to stay. So he moved his family to Texas. "Sure, life can be done on $400, $450 a month, but I would challenge others out there to buy diapers, groceries and all the things that you need for a family of three on $400," Sheehan told Wendler. "[Moving] feels good because I know I'm doing the right thing for my family, but it also feels sad." This got us wondering: What do teachers make across the country? When people (not just teachers and politicians, but reporters, too) talk about average salaries, they often use numbers that haven't been adjusted for regional differences in cost of living. Clearly, the costs of life — from rents and mortgages to movies, food and day care — vary widely, depending on where we live. Without adjusting for that, comparing teachers' salaries in New York to, say, California is classic apples to oranges. That is why we reached out to EdBuild, to see whether they could help bring more clarity to the conversation about teacher salaries. The education nonprofit has previously used data to map the nation's 50 most segregating school borders. Below, you can see what teachers in each state and Washington, D.C., make before — and after — adjusting for regional cost differences. EdBuild used 2015-16 average teacher salaries as reported by the National Center for Education Statistics and a cost-of-living index produced by the Council for Community and Economic Research. Before we get into the numbers, a few quick caveats: There is obviously wide variation in the costs of living within states, too, that these numbers can't clearly capture. 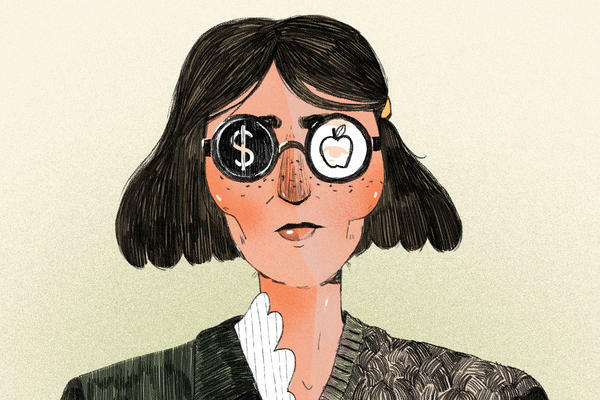 In some cases, deep pockets of veteran teachers may also conceal low pay for young teachers. If you're curious to know what states pay their starting teachers, EdBuild has looked at that, too. Oklahoma ranks 49th in average teacher salary but jumps to 40th. Still low, to be sure, and cold comfort to Oklahoma teachers, but it's nuance worth knowing. West Virginia is less mobile, moving from 46th to 43rd. Mississippi lands next to last in average salary but rockets up to 37th after the adjustment. At first, Indiana and California appear light-years apart, paying $50,715 and $72,842 respectively. But the cost of living adjustment, which favors relatively low-cost Indiana, brings the two states' salaries to within $100. Hawaii offers a similar tale of two salaries. Before the adjustment, it sits high up the list: 18th overall. After accounting for the state's high cost of living, Hawaii falls to the very bottom. Michigan moves in the opposite direction, from 11th before the adjustment to first. That's right, after adjusting for regional cost differences, Michigan tops the list with an average salary of $71,773.